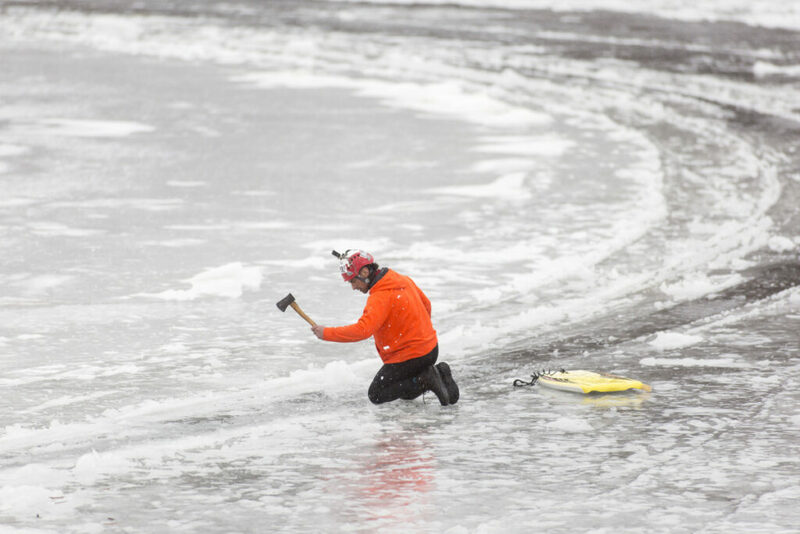 Christopher Angelo, armed with a pickax, a hatchet and a small chainsaw, walked onto the world-famous ice floe Thursday saying he wanted to study it and turn it into a giant peace sign. WESTBROOK — A New Jersey man with a history of staging public stunts began chopping and hacking at the Westbrook ice disk Thursday, saying he wanted to study it and turn the frozen expanse into a giant peace sign. Christopher Angelo, 44, of Lavallette, N.J., said he came to Maine to study the 100-yard-diameter ice floe. Angelo said he had set up underwater cameras, and planned to take core samples of the disk. Angelo said he has a college degree in biology, but is not affiliated with any university or research organization. He said he wants to get his master’s degree in ice disks. Angelo brought a pickax, a hatchet, an umbrella, a tarp and a small chainsaw with him aboard an inflatable raft. As he worked, he carried a foam body board, which he kept tethered on a leash. He at one point fell into the river up to his waist, but freed himself from the ice. Angelo eventually took his gear off the ice Thursday afternoon. The disk was still frozen securely in place, still intact though somewhat scarred from the encounter with Angelo’s chainsaw. Angelo has twice been arrested for staging public stunts. After the 2012 Superstorm Sandy, which ravaged the New Jersey and New York coastline, the Star Jet roller coaster was swept from Casino Pier in Seaside Heights, New Jersey, into the ocean and became an enduring image of the storm’s aftermath. Angelo was arrested after he climbed to the top of the damaged coaster and flew an American flag in January 2013. He was arrested again on the one-year anniversary of the storm at the same theme park when he climbed another ride. He said each time he was trying to raise awareness for storm relief. 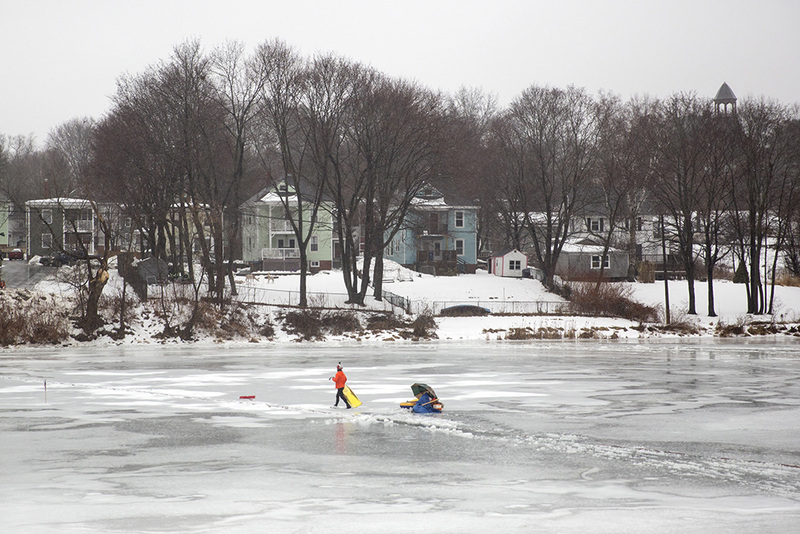 Christopher Angelo works along the edge of the Westbrook ice disk on Thursday. He brought a pickax, a hatchet, an umbrella and a chainsaw for what he said was a study of the ice floe. Westbrook police received calls about the man Thursday, but said in a written statement that Angelo was breaking no laws. The disk formed last week and rotated freely in the river until air temperatures plummeted and it froze into the river ice Tuesday. It has attracted crowds of curious locals and been the subject of worldwide media attention. Researchers from Maine and far away have been intrigued by the ice disk, an unusually large example of a phenomenon that has been documented in rivers in North America and Europe but is not entirely understood. Brown University researchers even set up a webcam overlooking the ice sheet to record its movements and eventual demise.